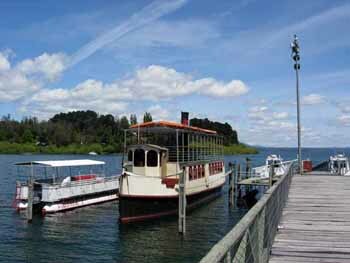 Villarrica is a simple, unassuming and humbly assembled town on the shores of the Lake from whence its name comes. 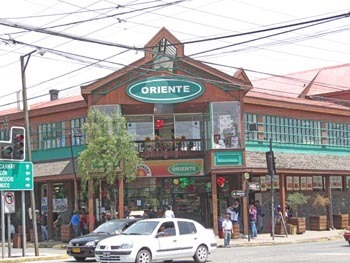 It is situated due west of the inspiring, trendy & vibrant vacation village of Pucón, which is about 15 miles away. It is hard to describe Villarrica without mention of its neighboring town of Pucón. Pucón, full of youthful life and energy has that constantly-on-the-go feeling that is reflective of the area's somewhat recent boom town success. 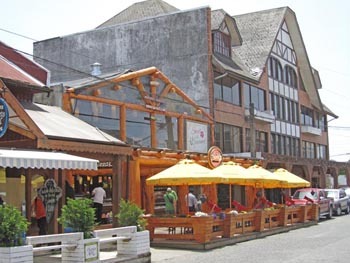 Flush from the recent infusion of investment capital, Pucon shines with newly built shops, trimmed with attractive natural finishes and interesting architectural details, offering chic classy goods. It's new, it's hip, and it gives off that I'm-here-for-a-great-vacation happy vibe. Add in the awesome presence of an astounding snow capped in-your-face volcano and one begins to wonder if this might not be the "next big thing" with international retirees and safe haven investors. During the drive west along the lakeside there are condos, stunning hotels and handsomely crafted over-sized wooden gates, with glimpses of the gorgeous privately owned second homes hidden just beyond the privacy fences and tasteful landscaping. All of this built around the alluring natural beauty of its locale. I'd give Pucón's investors and developers an A+ for successfully attracting a bevy of worldwide eco-tourism adventure visitors and summer-home families from the capital city of Santiago. 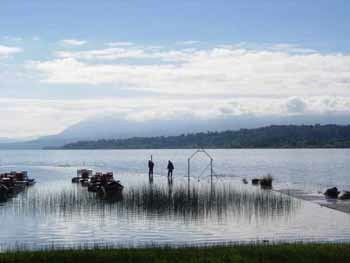 Villarrica, with a stable community of inhabitants numbering near of 45,000 is larger than neighboring Pucón at 15,000. But it doesn't endure the explosion to triple it's residents that its smaller neighbor to the east experiences every summer. And that is exactly what makes the mix of these two neighbors so interesting and attractive. Although already growing in popularity with international buyers we can foresee this yet under-developed community becoming a sort of "bedroom" town of Pucón. There are a million and one things to do here between Pucón and Villarrica. Spend your days biking, hiking, rafting, enjoying the lakeside activities, soaking in thermal hot springs or just meditating on the gorgeous awe inspiring Volcano, with its perpetually snow capped peak. 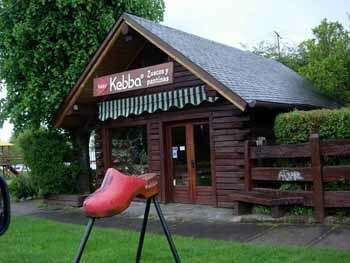 Summer nightlife here is vibrant, offering many restaurants and pubs, and Pucón even has it's own gaming casino. You can get most all of your shopping needs met here. 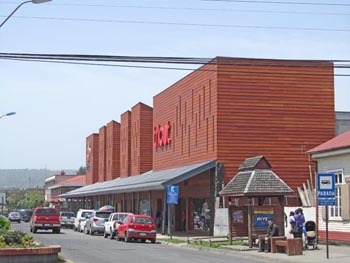 But when you're looking for something from a larger selection of stores then there's always the big mall just northwest in Temuco. Strategically located, Villarrica, is just about 45 minutes outside of Temuco, the regions largest city and home to an easily accessible national airport. The moderate climate, modern infrastructure, availability of services and mix of high energy and low-key activities (all surrounded by a lush green environment and awe inspiring view) make this Lake locale one of the top buying choices for real estate in Southern Chile.